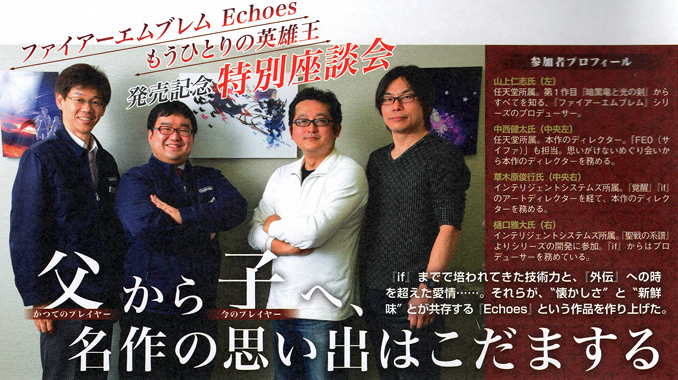 This interview was published in the June 2017 issue of Dengeki Nintendo released in April 2017. Hitoshi Yamagami (left) – Part of Nintendo. Fire Emblem series producer. Kenta Nakanishi (center left) – Part of Nintendo. Director of this game. In charge of FE0 (Cipher0. Toshiyuki Kusakihara (center right) – Intelligent Systems. Art director in Awakening and Fates, and works as director of this game. Masahiro Higuchi (right) – Intelligent Systems. A developer since Genealogy of the Holy War. Worked as producer on Fates.